If you have been planning on getting some ‘work’ done, there is no better time than now. There has been a steady rise in non-invasive aesthetic procedures in 2018 and there doesn’t seem to be an end in sight. From fat freezing procedures to new PDO thread lifts, there’s now more ways than ever to get the look you want without having to resort to surgery. Here’s a look at some of the most popular aesthetic procedures of the year. Cryolipolysis is a popular fat freezing procedure that uses cold temperatures to freeze and break down fat cells. According to research, fat has a different freezing point than other tissue – this is the same reason why butter hardens quickly when put in the fridge compared to other food. When fat cells are exposed to very cold temperature, they die naturally. Over time, our body process the dead fat cells as waste. Although the fat cells are killed by the chilling cold, the treatment does not harm the surrounding skin. The main goal of Cryolipolysis is to reduce the volume of fat in stubborn bulges around the belly, back, arms, thighs and even the chin that are resistant to diet and exercise. Z Lipo and CoolSculpting in Singapore are the two safe and effective devices that use Cryolipolysis technology. The main difference lies in the device, CoolSculpting is built in with one applicator while Z Lipo is built in with two. Different sizes of applicators are available to suit every size of fat bulges. For some people who want to learn how to lose body fat without surgery, another option is Vanquish ME by BTL. 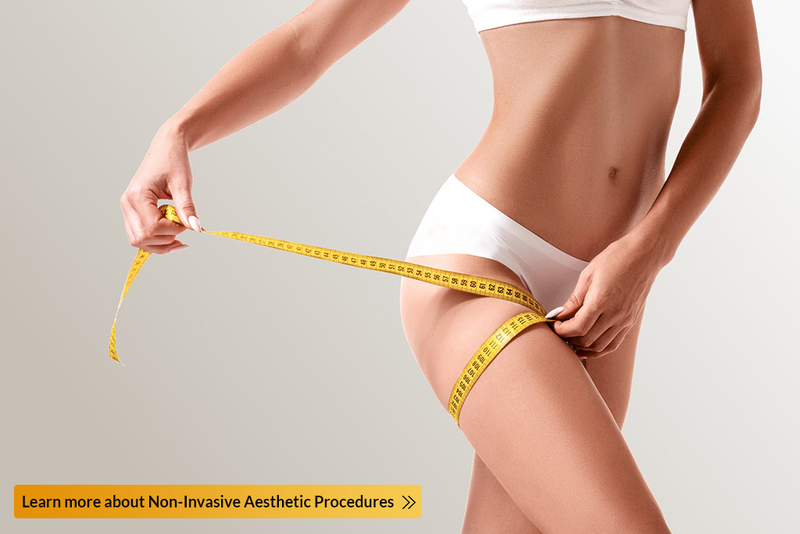 Vanquish is a non-invasive, no-contact procedure used to eliminates unwanted fat using radiofrequency technology. The US FDA-approved treatment is often used for deep tissue heating and for the circumferential reduction of the abdomen. Instead of freezing fat like Cryolipolysis, Vanquish heats fat to cause permanent fat reduction. What’s unique about Vanquish is that it has the largest treatment coverage compared with other devices. This means the whole abdomen can be treated in one session. Moreover, Vanquish is not limited to any specific BMI hence, everybody is a candidate. Ultherapy is another aesthetic treatment currently on the rise. For those who want to learn how to lift sagging skin without surgery or incisions, familiarize yourself with Ultherapy. This US FDA-cleared non-invasive face lifting procedure uses ultrasound technology to stimulate new collagen underneath the deeper layers of the skin resulting in a natural lift over time. What’s great about Ultherapy is that there is no downtime so you can return to your normal activities after the procedure. Some patients see an initial effect right after their treatment, but the real and significant results appear over 2-3 months as new collagen works to lift and tighten skin on the neck, chin and brow as well as smooth fine lines and wrinkles on the chest. Ultherapy is a clinically proven non-invasive alternative for those not ready for surgery and it can also be an option for patients who wish to extend the effects of cosmetic surgery. Many people shy away from facial surgeries due to their downtime. PDO threads are an excellent alternative to these procedures as they are minimally invasive and without downtime. These are made of 100% absorbable PDO (Polydioxanone) threads inserted within fine needles or cannulas. PDO is a collagen producing material that has been used in medicine in the production of dissolvable sutures (stitches) for 30 years especially in the field of cardiac surgery. These threads are very popular in the Asia especially in Korea and Japan where there are often called the V-Lift procedure. During a PDO thread lift in Singapore, sagging skin tissue is lifted and tightened immediately using the PDO threads. As the threads are re-absorbable, the threads will simply dissolve within 6 months but the lifting effect will remain for at least 2 years. As this procedure is technique dependent, make sure to consult an experienced aesthetic doctor who has the skills, good track record and experience in providing PDO thread lift. To achieve better women’s health, look to Ultra Femme 360. The innovative technology uses the US FDA cleared radio frequency technology available on the market for a treatment lasting an average of just 8 minutes. The procedure provides complete vaginal rejuvenation including vaginal tightening and labial remodeling. According to clinical studies, many women also experience an improvement in urinary stress incontinence after the treatment. Furthermore, Ultra Femme does not only tighten and rejuvenate the vaginal tissues it also improves the sensation which helps boost a woman’s confidence and self-esteem. Ultra Femme requires no aesthesia, no downtime, and most patients report no discomfort but only a warm yet comfortable sensation during the procedure. If you have your heart set on cosmetic surgery, consider a non-invasive alternative. These aesthetic procedures have become more and more popular in recent years as both men and women realize that surgery isn’t always needed to get the cosmetic results you’re looking for. Not only are these procedures non-invasive, but most require no preparation, no downtime, and cause little to no pain. The side effects are also minimal and often none at all. For more information about any of the procedures mentioned or to schedule an appointment with Dr. Sylvia, our Harvard-trained aesthetic doctor in Singapore, call us at the Cutis Laser Clinic.